So here we are. 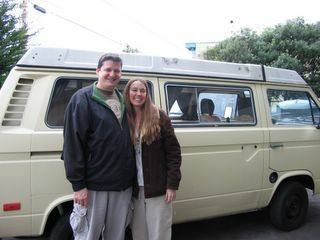 Rob, Carley and our van. The only character missing from this cast is our Nicaraguan dog, Kina who will undoubtedly be featured in future posts. We should be in the van right now, nearing Tupelo, Mississippi (Carley's hometown), but we're still in the Bay Area (look for the story in our next post). In the meantime, we want to get our blog going. Starting tomorrow, we'll be headed across the country and then down south of the border, ultimately to Guatemala (we think) where Rob will be teaching English as a foreign language and Carley will continue to work for May I Speak Freely Media and hopefully get her hands into some other projects to advance human rights in the region. We'll be taking about a month to check out Mexico before settling a while in Guate. This blog will keep our friends and family updated on our whereabouts and hopefully offer some interesting insights into and knowledge of the cultures we visit. On to "And they're off!! almost..."
We decided to name our blog "Truckin'" after the Grateful Dead song which has several meaningful lyrics, but for this journey, this line is by far our favorite: "Sometimes your cards ain't worth a dime, if you don't lay'em down."